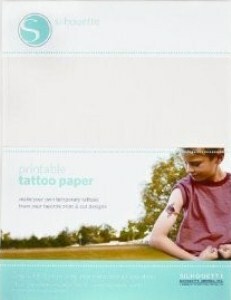 Make temporary tattoos with our Temporary Tattoo Paper. Fun for kids, sporting events, or other promotional purposes to show off designs as they are applied onto skin. Temporary tattoos apply easily with water, generally last a day or two, and can be removed with a washcloth and warm water. Simply print designs onto this unique paper with an inkjet printer. Then, with the included adhesive, use the Silhouette cutting machine's Print & Cut feature to cut around the image contour.